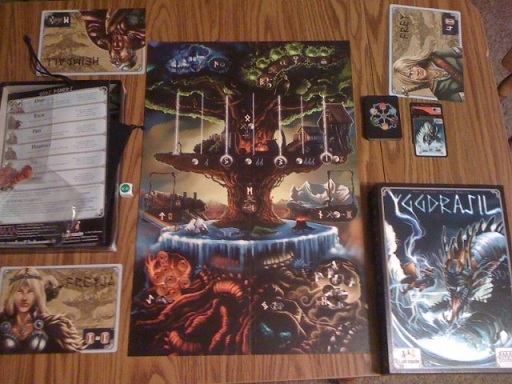 A pretty interesting Norse based cooperative game that recently came out was Yggdrasil . In Yggdrasil, each of the players takes on the role of one of the Norse gods attempting to prevent Ragnarok by keeping their enemies out of Odin's house. Each turn, the active player starts by flipping the top Enemy card - at which time the enemy represented on the card advances towards Odin's house, and also has a special evil power occur (such as bringing forward one of the other enemies, causing a frost giant to appear, or causing one of the Valkyries' islands to submerge). After this, the player is allowed to perform 3 different actions of the 9 available (one of the gods can actually perform the same action twice), and often the actions will culminate in an attack on one of the enemies (this helps knock them back away from Odin's house. The game continues like this until a certain number of enemies advance too far (one is in Odin's house at the end of the turn, 3 are across a certain barrier, or 5 are across a different barrier) in which case the players lose and Ragnarok ensues, or until the "Enemy" deck runs out of cards (at which point the gods have prevented Ragnarok and won the game). The first thing that I liked about Yggdrasil was the number of available actions. Many other incredibly fun and challenging games (ahem, Pandemic) sometimes feel a bit repetitive because there are only a few actions that a player can perform. Yggdrasil has more actions than I have seen available in any other cooperative game, which really helps the game to feel like you have more options. The next thing that I like about Yggdrasil is how the "vikings" work. When fighting against the enemies, a player must achieve a certain strength (normally 5) in order to win the battle. To do this, he can contribute any number of vikings that he has available (before rolling the die), add the value of his enemy-specific weapon, roll a die (which can add 0-3 strength), and finally add elves if his die roll was not high enough. This is all fine. However, what I really like about the vikings is how you get the vikings. There are 4 different islands that the Valkyries can go to. Each of these islands is represented by a bag full of vikings and fire giants. One of the actions that a player can perform is to move the Valkyries by one island (the closest islands have the worst odds of getting vikings), and then to pull out 3 pieces from the bag; any vikings pulled are kept by that player and available for future fights, but any fire giants pulled are put back into the bag (thus, getting a "good draw" stacks the odds against getting further good draws). There are also two other actions that a player can perform on his turn related to the vikings. He can take an action to move 5 vikings from the "deceased" pile into one of the bags, or he can pull 4 pieces out of a bag and remove any fire giants pulled (but put the vikings back). Therefore, the players are constantly adjusting the odds of getting the crucial vikings from any given bag - and if he neglects any of these actions, he could easily find himself unable to get enough vikings at a very critical juncture in the game. The next definite pro of Yggdrasil is the number of players that it allows. Often cooperative games struggle with only supporting a very limited number of players (the new Lord Of The Rings: The Card Game only supports 1-2). Yggdrasil supports 1-6! What's more, I think that Yggdrasil would actually be fun with each of those numbers of players. Because of how weapons work (they are specific to each enemy, and you can only get the +2 weapon if you already had the +1 weapon for the corresponding enemy) I think that the different numbers of players would even add different strategic choices and conundrums. The final pro that I will mention about Yggdrasil is how frost giants work. When a Loki card is flipped, he brings out a frost giant. The frost giants handicap the gods in some way while they are out (prevent them from performing certain actions or causing an enemy to become stronger). This in and of itself makes an interesting dilemma in the game, as players are forced to expend resources fighting the frost giants instead of the enemies. However, the frost giants can also be put together to form certain runes, which give the gods major bonuses (such as gaining 15 vikings that they can split amongst themselves). This causes the frost giants not to only be a pest, but also a potential source of "giant" boosts for the gods (hehe... I like puns) - players might even choose to fight the giants before they are even revealed by Loki in the hopes of completing one of these runes! Now that the pros have been covered, I really only found a couple of complaints about Yggdrasil. First, this game is incredibly anti-climactic. Throughout the game you are constantly fighting off the enemies and frantically trying to strengthen yourself for the next fight. It can feel very exciting and can keep you nervous throughout the entire game. But the game ends by the enemy deck running out. You don't really accomplish a major goal like finding the cure for the diseases in the world, escaping an island, or completing your quest. You simply survive. You flip over the last enemy card, advance his figure, and then see that you didn't die - which means you lived. I realize that this is simply how it will have to be in this game because of how the mechanics work, but it still seemed a bit disappointing. I honestly have no suggestions for how I would change it, though, because I think any real change to this would drastically change the game. One other thing that I should mention is a common difficulty in cooperative games. Since everything is fully known in the game, an incredibly outspoken (bossy) player can easily dominate the game and reduce the enjoyment of all of the other players. This really happens in a lot of cooperative games where "discussion of best potential moves" can quickly turn into "do it this way, or you're stupid." My fix for this - tell those people to shutup... but then again, maybe I'm the outspoken one in my group. Overall, I give Yggdrasil an 8.5/10. I really enjoy this game. I think that anyone that enjoys cooperative games should definitely give this one a few plays, as I don't think that you'll be disappointed. If Yggdrasil sounds interesting, you should check out Space Alert, Hanabi, and Lords of Waterdeep. I would like to thank Z-Man games for providing a demo copy of Yggdrasil for me to try out. 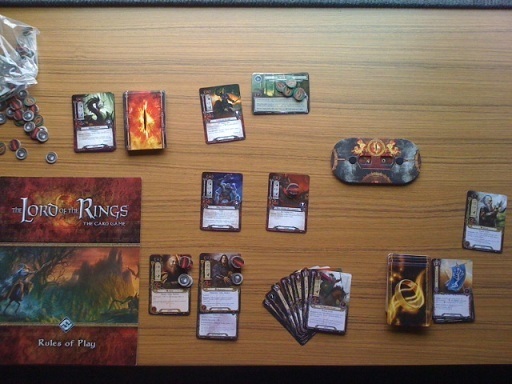 A game that I thought would be innovative (and thus I really wanted to play) was Lord Of The Rings: The Card Game . In Lord of the Rings, players can construct a deck of cards and heroes, and then they play cooperatively to attempt to defeat one of several scenarios that are available (each consisting of a different mix of enemies and events that the heroes will face). Each turn the players will collect resources for each of their heroes with which they can then play ally and attachment cards (or wait and play events when they would be most effective or use them for special abilities). Next, they may send some or all of their characters to go on a "quest" (this is the crux of the game - if the players never send anyone on the quest, they will lose). After questing, players can "travel" to a location - which essentially makes questing a bit easier. Next comes encounters and combat; based on how much "threat" each player has, the monsters will be divided up among the different players - and then those monsters attack. Players can choose who to use as a defender (who only serves as a shield), and then from whomever is still not "exhausted" (tapped), they can attack the monsters in front of them. Finally, the players do cleanup - untap, increase threat, assign a new first player. This continues until either the players are all dead (through having their heroes die or gaining too much threat), or until all of the phases of the quest have been completed. My first pro of the Lord of the Rings card game is that it has found a way around the "a super-bossy person making a cooperative game miserable" problem. Often, in great cooperative games like Pandemic , a single bossy player will essentially tell everyone what to do (while all the other players are thinking of telling him where to go... and I imagine it's not a nice place) and attempt to play the game as if it was one player and he was just taking everyone's turn. However, in the Lord of the Rings card game, each person is holding an ever-changing hand of cards that only he knows. This means that each player is forced to make his own decision of what the best play is at any given time. This really helps the cooperative genre in general, and I hope that future games continue to do something like this to fix the annoying bossy guy problem. The next pro for the Lord of the Rings card game is two-fold. First, you may construct your own deck before playing; secondly, there are different scenarios. When I first heard about the game, my immediate thought was "once I create a deck that wins, why would I ever bother buying any new expansions or creating anything else?" (Which seemed very short sighted of Fantasy Flight, the kings of the board game expansions sales.) Well, this is where quests come into play. This is the first cooperative game that I know of that has this concept of playing with different win conditions each time. (Though it's not actually win conditions - the win condition is always beat the quest; but the quest does change.) Since there are different quests, with different levels of difficulty, a player may need to construct his deck in a different way for one quest versus another - and, of course, a really dedicated player would try to create a deck that could defeat any of the quests. However, as soon as he does that, the next "adventure pack" will probably come out, consisting of a new quest for him to defeat. This will let him know if his deck really is awesome (as he assumed), or if it still has weaknesses (and the adventure pack should have new cards he could add to his deck to address these). These two concepts fit together masterfully, and I was quite pleasantly surprised by the outcome. The next thing that I will list as a "pro" (though it's more of something that I think is interesting) is how the characters are used. Each character gets exhausted when he is used on a quest, to defend, or to attack. And, if you don't wind up putting characters in each of these three areas, you will probably lose the game. This causes an interesting balancing act. The specific thing that I think is interesting is that the characters that you use to defend get exhausted by defending and don't have the opportunity to attack. I don't think that I've ever played a game in which my characters could not attack whatever enemy was attacking them - but it adds a very frantic dynamic to the game, as you never feel like you have enough characters (which is good for a cooperative game). My first con for the Lord of the Rings card game is that there are lots of minor things to remember. Once you play it several times (especially with extra people helping keep track), the game flows pretty well. However, after about 5-7 plays, I am yet to be able to play the game without the instructions next to me as a reference guide to step through each stage. Even things that sound basic like an enemy attacking you have extra steps - you play other cards from the encounter deck on top of the attackers before they attack to see if they have a "shadow effect." It makes the game much harder to teach, and also harder to play. The next thing that annoyed me about the Lord of the Rings card game is that it seemed designed to force you to pay extra money to get the full game. 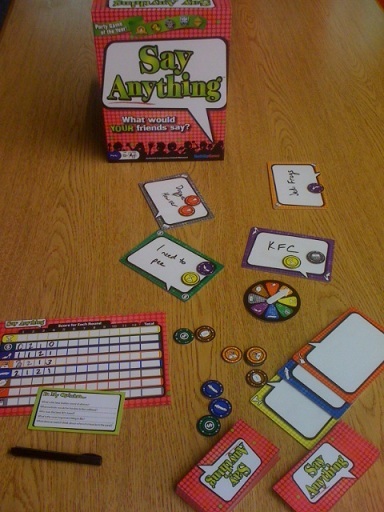 The basic starter set is designed for 1-2 players, but claims to be up to 4 players if two starter sets are combined. The main two reasons that a single starter set is only up to 2 player is that 1) there are only 2 "threat dials" (which you can remedy with a scrap piece of paper) and 2) there aren't enough cards to allow you to make 4 "tournament legal" (50 card) decks. However, if you play with scrap paper and the basic introductory decks, you can support 4 players out of a single starter deck. This really isn't a game play issue at all, but it just seemed disappointing to buy the game to immediately realize I had to buy another copy of it if I wanted to be able to play with a group. Overall, I give Lord of the Rings: The Card Game a 9.0/10. I really enjoy the game, I appreciate the new elements that they have brought to the cooperative genre, and I look forward to seeing what the new adventure packs bring. If you aren't completely turned off by constructing a deck or by cooperative games, I would recommend trying it out. For more reading about this game, you can check out this Review of Lord of the Rings LCG from Play Board Games, or another Review of Lord of the Rings LCG from Games With Two. 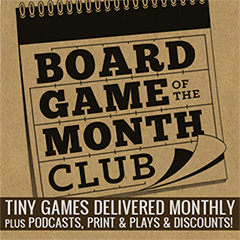 You can also read my review of the Shadows of Mirkwood Expansions for Lord of the Rings, my Game of Thrones living card game review, and my Star Wars living card game review. 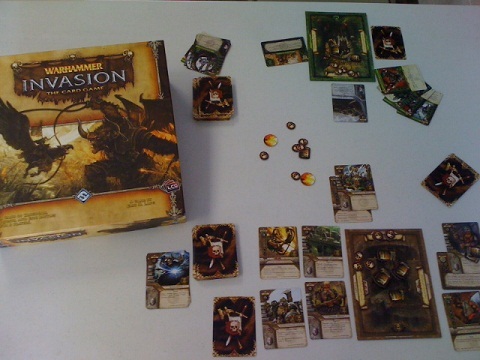 A game that I was really excited about was Warhammer Invasion . Warhammer Invasion was one of the first "Living Card Games." This means, like Magic, Pokemon, etc, you would construct a deck out of cards and play against your opponents; however, unlike with normal Customizable (or Trading) Card Games, in Warhammer, the packs were not randomized. Now for gameplay... In Warhammer, each player controls a capital with three different area - the battlefield, kingdom, and quest areas. The object of the game is to destroy two of your opponent's three areas. First, you get to generate resources based on the amount of power in your kingdom area; next, you draw cards based on the amount of power in your quest area. After this setup, you use your resources to play any units and/or support cards in any of the areas of your capital. Next, you can attack your opponent, and finally, it is the other player's turn. The first pro for Warhammer Invasion is that it is a Living Card Game. I personally loved playing CCG's when I was younger - my CCG's of choice were the Star Trek and Star Wars CCGs made by Decipher. Unfortunately, I have one of those personalities that gets addicted to buying packs. Therefore, LCG's are a great way that I can still enjoy all of the elements of deck construction, playing the game, having tournaments, etc, without having to worry about how many packs I will wind up buying or how much I will spend on the game in any given week. I really appreciate Fantasy Flight introducing several of their new games in this format. The next pro that I have for Warhammer Invasion is how the different areas of your capital work together. Whenever playing a new unit you had to decide which area you want to place them in - do you want to use them to get more resources, more cards, or to be able to attack? If you put them in the kingdom or quest areas, they may help more in the long run, but they will also wind up serving primarily as defenders. Whereas, if you place your units in the battlefield, they really serve only as attackers - but if you don't play any attackers, you can't possibly win the game. The third pro that I will mention for Warhammer Invasion is that each of the races plays differently. Honestly, I expect this in a deck building game (such as the different colors in Magic), but it is still an important element. Fantasy Flight did a good job in making sure that playing as the Dwarves (who have a lot of defensive things they can do) takes on a different feel than playing as the Orcs (who are almost exclusively attackers - even injuring their own units to attack more), or the Chaos (whose specialty is "corrupting" units), Humans (who are able to move units between areas of their capital), or any of the other races. A final pro about the game is quests. One of the types of cards in the game is the "quest" card. These are placed in the Quest area of your capital, and once you have played one, you have the option of having your units (as you place them) be "questing". While questing, a unit builds up resources that can then be spent for a bonus (for example, one of the Dwarf quests allows you to discard the unit on the quest to destroy two attacking units - but only if there are at least 3 resources on it). I really think that the quests are a neat concept, and I'd be interested to see how different people would be able to use them when constructing their decks. The biggest con that I have for Warhammer Invasion is that it really didn't have a very unique feel to it. As one of my friends put it, "it feels generic." Whereas I liked the different areas of the capitals, there wasn't really anything else that set this game apart (even the quests seem to just be a different way to represent an effect that has to "charge up"). I could continue playing it, but I don't feel like it has brought something entirely new to the table. Another con that I had for Warhammer (that I have heard was fixed in later expansions) is that they don't give you all the cards needed to build the deck however you want. As with all deck building games, there is a limit to the number of copies of a card that are allowed in a deck. This is true in Warhammer as well. However (at least in the base set and the first few expansions), instead of the set of cards including enough copies of each card to allow you to put the limit of each card in your deck, the sets have several copies of some cards and only one copy of others. Therefore, if you wanted to build a deck consisting of several of the card you only had a single copy of, you would have to buy several of the packs - and then you would get around 9 copies of some of the other cards, with absolutely nothing to do with them (you don't really trade cards in an LCG format), so you might as well throw them away. There's really not all that much more to say about Warhammer Invasion - the complexity of the game (as often happens) doesn't lie in the mechanics of the game, but rather in the cards and their interactions. Learning the game is really fairly simple and straightforward (another pro), but the number of different cards prevent the players from constantly playing the exact same way. To me, the key aspect of pre-constructed deck building games is how many other people in your geographical area are playing them - if a lot of people are playing them, then you have lots of opponents and have the possibility of playing in tournaments, and the game can be a lot of fun. If nobody else around you is playing, then you probably won't wind up playing it, and you won't have a great desire to work on improving your deck. Overall, I give Warhammer Invasion an 7.5/10. I enjoyed the game well enough that I would continue to play it if the people around me played. Unfortunately, since I don't know anybody that actively plays the game, my hope for being able to enter a tournament is basically non-existant; and so I will probably wind up getting rid of my cards. And, in full disclosure and fairness to the designers of the game, there's a really good chance that I would have liked this game a lot more if I had the opportunities to play it more as it was meant to be played - where I would construct a deck and try it against many different opponents. This would have also kept me in the game long enough for them to further develop the 4 base races as well as the races that they introduced in the expansion sets. Another game that I picked up simply because of the Days of Wonder logo was Cleopatra And The Society of Architects (yeah, I'm a bit behind the curve on this one since it came out a few years ago). 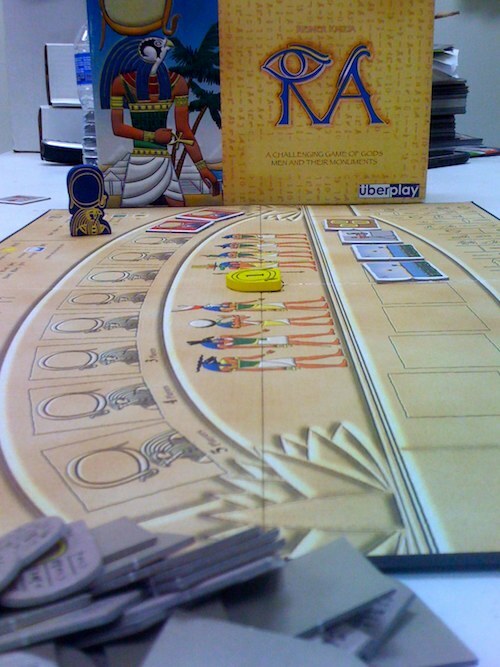 In Cleopatra, each player takes on the role of an architect that is trying to build parts of Cleopatra's new palace in order to gain her favor. While doing so, the architects may (will) be tempted to cut some ethical corners to try to get ahead. It's ok, everybody does it... but if Cleopatra finds out about it, she will throw you to the crocodile! How this plays out is that each turn a player will be able to either draw new cards from one of the three draw piles (and then a new card is added to each draw pile), or he will be able to go build new buildings (these get victory points). Various deeds during the game, like drawing cards to have more than 10 in your hand, or playing certain cards, will gain you "corruption" tokens. At the end of the game (which occurs when all but one of the different types of architectural elements have been built), whoever has the most corruption is fed to the crocodile god (Sobek?) and instantly loses. Of the players still alive, whoever has the most victory points is the winner. The first thing that I really like about Cleopatra is the corruption. When I first read through the rules, I thought to myself, "this sounds interesting, but I'm guessing people will just avoid getting corruption to prevent this. 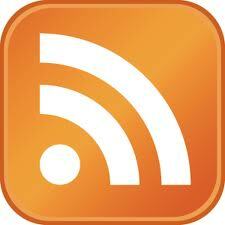 It'll unfortunately become a non-important factor of the game". Me, you were wrong! The game is set up very well so that there's not really a way to avoid getting corruption tokens. Since whenever you draw cards you draw the entire stack, you will at some point or another end up with some corruption tokens. Because you have some, you're at risk anyway, and so you are more willing to get a few more - after all, you see your opponents getting "probably" more than you, right? And there are also a few ways to get rid of corruption tokens - you can do that by building a sanctuary (this deals with how you place certain elements that you build; I won't go into it, but needless to say it lets you remove about 3-8 tokens at the end of the game), and through sacrificing to the Great Priest (which I'll talk more about later). The next thing that I really like in Cleopatra is a very minor thing. When setting up the draw deck, you take half of the cards face down and half of them face up and shuffle them together. After this, whenever cards come out, they stay in their current orientation (face up or face down). Therefore, when you are drawing a pile of card (normally containing 1-5 cards), you don't know entirely what you're getting. As I said in the previous paragraph, you can't always avoid corruption - and here's one of those times. If you draw cards with the corruption symbols you might as well use them because, if you don't, they are worth corruption at the end of the game (if they're still in your hand). Aside from the corruption aspect, it is also a neat concept that you take a pile either because it has some of what you want or because it might have something useful to you. As I said, this is a fairly minor point, but I really like it. The final pro that I will mention is the visual quality of the game. As you can tell from looking at the picture, the game is beautiful. The designers, publishers, or whomever was involved were really creative in making this game amazing. You actually take the bottom of the box and flip it over to represent a raised level, and you build things on top of the box, around it, and in front of it. Playing the game takes up a decent amount of space because of this, but it is really gorgeous. One of the things I promised to talk about is the sacrifice to the Great Priest. I consider this a neutral point in the game. Every time that a player builds on his turn, he must roll all of the dice that are not currently showing an ankh symbol. Once all five dice are showing an ankh, a sacrifice occurs to the Great Priest. Players each secretly bid victory points (which they don't get back), and based on how much each player bids, you will either gain or lose corruption tokens (1st place loses 3 corruption, each other player gains at least 1 corruption). In theory, I really like this mechanic and think it is a good addition to the game, but it occurs so infrequently in practice that it becomes a non-factor. Only 1 of each of the 6 sides of the die is an ankh, so most of the dice rolled will be blank. I personally think this would have worked best if on average the sacrifice occurred 1-3 times per game, but whenever I have played it happens more like 0-1 times per game. I think if the dice had 2 ankhs on them, it might help. For the main con, the game suffers (to a lesser degree) from the same problem a lot of Days of Wonder games suffer from - replayability. Days of Wonder makes excellent "gateway" games that can be taught to gamers and non-gamers alike (I didn't write this in the pros section, but another pro is that it is easy to teach to anybody). However, to achieve that level of ease in teaching the game, the games are often not very involved; thus limiting the number of strategies that can be applied in the game. Fortunately, the corruption element of Cleopatra adds quite a bit of replayability compared to some of their other titles, but I still don't know how many times I will play it long-term. Again, I think that this does have more replayability than several of their other titles, but I don't see myself playing it as much as something like Dominion or Pandemic . Honestly, though, replayability is based more on what your friends fall in love with than anything else about the game; so if your friends love Cleopatra, you may be able to play it dozens of times with no problems. Overall, I give Cleopatra an 8.5/10. I bought the game knowing nothing about how it worked, but only based on the fact that Days of Wonder made it - and I was quite pleasantly surprised. 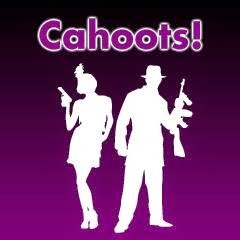 This is a quite enjoyable game that I think most people should try. An auction game that I picked up in a math trade recently (and then donated to my FLGS after it got quite wet in the tornado) was Ra. In Ra, players are attempting to purchase different tiles to ensure that they either score victory points (or don't lose victory points) at the end of each epoch (scoring phase). To do this, each player starts with three bid tokens of different numbers. On a player's turn, he gets to choose between 1) drawing a new tile from the bag and adding it to the set of tiles available for auction (this could potentially start an auction), 2) purposely start an auction, or 3) steal one of the tiles that is currently in the auction pile (this can only be done if they have a special "god" tile that they have previously purchased). Whenever an auction begins, the players each have one opportunity to place their bid using one of the bid tokens that they have available. The winning bidder gets all of the tiles that were on the board, in addition to the bid token that was in the center of the board (which they turn facedown until the end of the epoch), and then they place their bid tile in the middle of the board. Play continues this way until all of the players have run out of face up bid tokens, or until a certain number of "Ra" tokens have been drawn (Ra tokens are tokens that instantly start an auction when they are drawn from the bag). One of these conditions signifies the end of an epoch. At this point, players score based on the number and selection of tiles they own. Rinse, repeat. (At the end of the third epoch, a few extra things score). After three epochs, the person with the most victory points wins! The first pro for Ra is how the bid tokens work. I absolutely love this mechanic - and it really gives the game a different flavor than any other auction game that I have played. I love so much about them, that I'll probably have to split this into several "pro's". The first bid token pro is that they switch out whenever you win an auction. Because of this, the person with the highest token at the start of the game won't necessarily have the ultimate trump throughout the game. In fact, depending on what he purchases, he has a chance of trading in his high token for the #1 (worst) token, in which he'll only be able to win an auction if nobody else bids! This causes there to be a sub-game inside of Ra - each player being careful to not only collect the best tiles, but to also make sure that they don't wind up with the worst bid tokens. But even then, a skilled player can do well with very low bid tokens if he adjusts his strategy; he must simply start auctions more often so that the players with the better tokens don't get the luxury of spending them on a large set of tiles! The bid tokens are just plain awesome. The next thing that I like about the bid tokens is that when you win an auction, you have one less token available to bid with for that epoch. 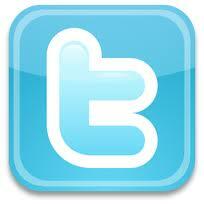 Therefore, nobody can ever win more than three auctions in an epoch. This really helps keep any single player from gaining too much of an upper hand in the game. It does, however, allow an opportune player to have the privilege of having a "push your luck" element at the end of an epoch. If one player can outlast everyone else to where they have used all of their bid tokens (thus he is the only player still playing), he can keep drawing new tiles from the bag - but if he fills up the Ra track, then he will lose all of the tiles that have been drawn, as there is not an auction once the last Ra is drawn! The bid tokens continue to be awesome. The last pro that I will mention about Ra is that there are both positive and negative tiles that can be drawn. 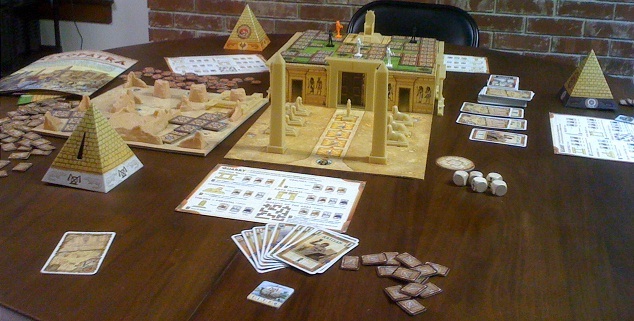 Some of the tiles are "destruction" tiles, and whoever wins the auction that contains these tiles loses two of his useful tiles of the given type (for example, gaining a "Pharaoh" destruction tile makes you discard two of your "Pharaoh" tiles). This prevents the push your luck element that I previously mentioned from becoming overpowered. It can also drastically change the mood of a set of tiles instantly. A set of tiles that would easily draw out the largest bid token can go from being completely wonderful to only being somewhat good in a single draw. This is a nice element to the game; whereas the game would probably still play well without it, this element really adds a nice touch that helps take Ra to the next tier of games. The only real con that I found when playing Ra is that passing the bag around for everyone to draw a tile on their turn winds up taking about as much time as the actual gameplay. After the first time playing, we quickly gave that up and designated a single person to draw for everyone. This speeds up the game as you're not constantly worried about passing the bag, making sure that the tiles don't fall out, and making sure you don't accidentally cheat while drawing. Overall, I give Ra a 9.5/10. In my opinion, this may be the best auction game on the market. It is quick and easy to play, but also has the depth to keep me wanting to play it again and again. I would highly recommend that anybody that doesn't have a strong aversion to auction games make a point of trying it out. If you like auction games like Ra, you might also want to check out Princes of Florence, Power Grid, and Furstenfeld. 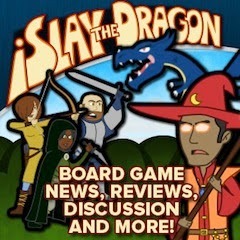 And, for another opinion of Ra, you can check out this Review of Ra on I Slay the Dragon.